With the efficient orthodontic solutions provided by William T. Schlosser, DMD, LTD, adult patients are able to receive the benefits of straightened dentition quickly. Our practice offers several trusted, discreet approaches for rapid improvement of dental alignment, including Six Month Smiles®, the Inman Aligner™ and Smart Moves® clear aligners. We are experienced providers for these orthodontic systems, assisting patients in Springfield and areas near Chatham and Rochester to achieve the healthy, appealing smiles they deserve. While similar to traditional metal braces, Six Month Smiles® is an accelerated orthodontic system, designed to produce results within six months. In order to correct the positioning of your smile, these braces utilize clear brackets and tooth-colored wires. 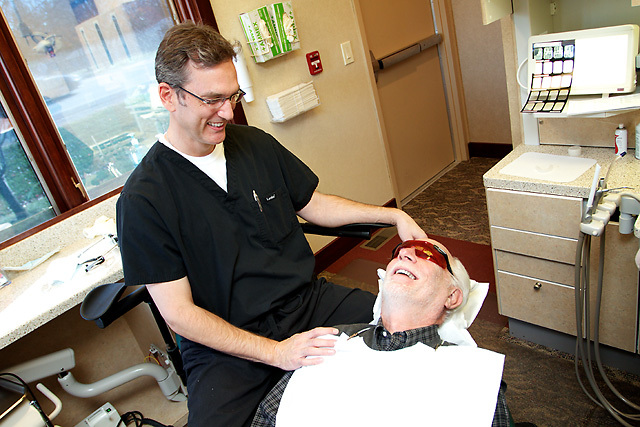 With easily adjustable components, Dr. Bill Schlosser is able to tailor this treatment to suit your individual needs. The materials and gentle movement used in Six Month Smiles® offer efficient and safe movement of the teeth, enhancing the proven mechanism used by traditional braces. Ideal candidates for Six Month Smiles® include patients with minor alignment issues who have not previously received orthodontic treatment. In addition to an improved smile, a secondary result of uniform teeth is good oral health. With dental alignment through Six Month Smiles®, Dr. Bill Schlosser can achieve greater aesthetic success along with other advanced procedures such as dental implant placement and restoration. Comparable to a retainer, the Inman Aligner™ is form-fit to create optimal alignment for your unique smile in a short time. This advanced oral appliance makes use of spring technology to push teeth into place. In six to 18 weeks, this discreet option improves alignment, whether used on the upper or lower arch of teeth. The Inman Aligner™ is removable, allowing patients the freedom to enjoy normal social activities such as taking pictures, laughing, and eating. Although convenient to remove, our Springfield dentist recommends patients wear aligners at least 20 hours a day to obtain lasting benefits from this treatment. Minor tooth misalignment is easily corrected with removable clear aligners. Smart Moves® is an invisible aligner system which is made in a trusted lab using patients’ impressions. The series of aligners are customized to individual smiles, creating a unique treatment plan for those who qualify. Patients wear a set of aligners for two to three weeks each, replacing them with the next customized set in the series. Daily life is undisturbed with Smart Moves®, and patients can enjoy eating, laughing, and smiling with confidence. In some cases, adults who have undergone orthodontic treatment find that their teeth have gradually returned to a misaligned position. Potential causes for this relapse can vary, from neglecting to wear a retainer to delayed jaw growth or tooth loss. Depending upon the situation, Six Month Smiles®, the Inman Aligner™ or clear aligners can quickly reposition the smile. Dr. Schlosser can help restore a beautiful smile once attained through orthodontics. Serving patients in Springfield, Chatham, Rochester, and surrounding areas, our dental team is passionate about helping adults achieve beautifully uniform, healthy smiles. To learn more about our reliable adult orthodontic services, call our practice today!